The next days were spent investigating the last of the leads, and it was decided a trip back into the swamps to a local resting ground. The party made their way without much difficulty to the Tomb, but hilarity ensued when they entered the steep, mud/water slicked main entrance. Players were beset by Swamp Gargun, smaller sized orcs with a mean disposition, and in the melee each player save two slipped and fell. Down the passage creature and player slid, knocking over their comrades as they went. Players were diving on creature and vice-versa, but somehow in the din of battle they emerged, muddied, battered but alive. Later, after making a trip via portal back to Corvis, they returned for what they hoped would be a final time and fortune smiled on them when they discovered the secrets of the Tomb. Returning with information, they discovered the festival was underway, and masses of undead had encircled the city, preparing for decimation. In the midst, the players faced off against a young lass, and a new player to the intrigue - one whom had escaped their original inquiries. They wound up giving a cherished ancient blade to the lass, while attempting to keep the new arrival from escaping through a portal. So, they decided at this juncture to ignore going to Jo'sRun, and focus instead on making the journey West through Grand Lynne and Coppice, and then onto Yggsburgh. After a bit of respite in Grand Lynn, the party weaved their way through Coppice, and down into Garroting Deep. While camping there the 2nd night, they encountered an old man. Music played as he approached them, powerful and majestic in his coming, and each player fell under the spell of the Forestal. After a brief meeting, which some of the players took as a sign, they hurried out of the Deep and onto their final destination...Yggsburgh. 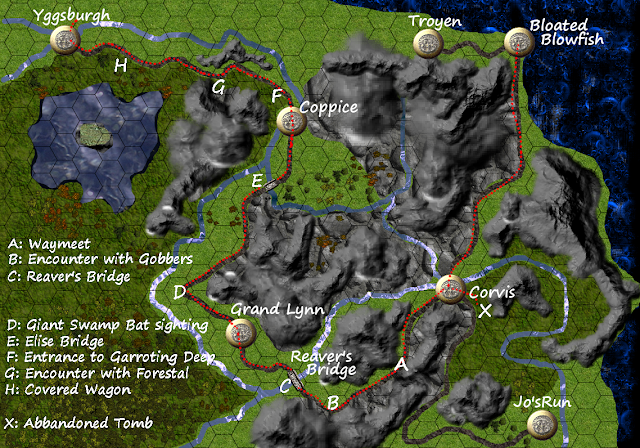 Below is included the path that the players took, along with a key to encounters/places of interest. Once they were settled in The Outs Inn, early the next morning they started up the path that would lead them to Castle Zagyg. Only when the players got to the fork in the road did they see what lay ahead. Jutting above them the Castle loomed in the distance, foreboding and menacing. To their left and down in a valley lay another mystery, The Dark Chateau, rumored to be the original home of the Mad Archmage himself. It was at this point the players threw a wrench in their own desires, wasting a ton of energy to make it to the City of Legends, and planning to explore the Castle fully, they instead decided with a name like "Dark Chateau", the place had to be explored. They have explored the first floor, and found the basement entrance. From there they discovered an animated Guardian glove, that gave open slaps that paralyzed it's prey. A couple players had single HP remaining after the battle.